We are unable to ship your order! 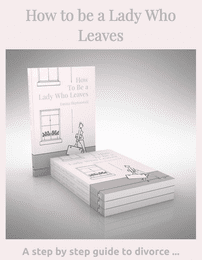 How to be a Lady Who Leaves is a guide book for any woman thinking about or going through divorce in England and Wales. Packed with information, practical hints, tips, extra resources and case studies from ladies just like you going through divorce. Does the thought of leaving your marriage scare you to death even though you want to leave? Are you panicked by the thought of all the paperwork, the legal bills and understanding what it will mean for you financially? Are you concerned that divorce will have a detrimental impact on your children and this wracks you with guilt? Do you wish you understood the divorce process? How to be a Lady Who Leaves is for you if you answered YES to any of these questions. ""Emma Heptonstall’s book is a crash course in Divorce - all you need to know but where afraid to ask. The book is highly readable and jammed packed full of useful tactics, tips and advice spanning the nuts of and bolts of the legal process, understanding your finances and how to successfully put your children at the centre of your divorce"." ""Relying on the advice of your lawyer, friends and family is good but having the Divorce Coach on your side is priceless. It's important that you think strategically and logically and that you keep emotion out of your decision-making as much as possible”."